MaComfort is a free and commercial program for the Microsoft Windows operating system that brings Mac-like functionality to Windows devices. Computer users who work with different operating systems have to get used to the differences of those systems. If you work with Windows and Apple Macintosh devices for instance, you will notice quite a few differences. This can be something as simple as a missing key on the keyboard, or something bigger such as the way programs are installed. A very basic example is the difference in keyboard shortcuts. Mac users use Command usually as a modifier key while Windows users Ctrl and not the Windows-key. MaComfort is a software for the Windows operating system that brings some of the functionality of Apple Macintosh computers to Windows. The free version of the program offers four different categories that bring functionality from Mac to Windows. The categories are keyboard, active corners, spaces and quicklook. 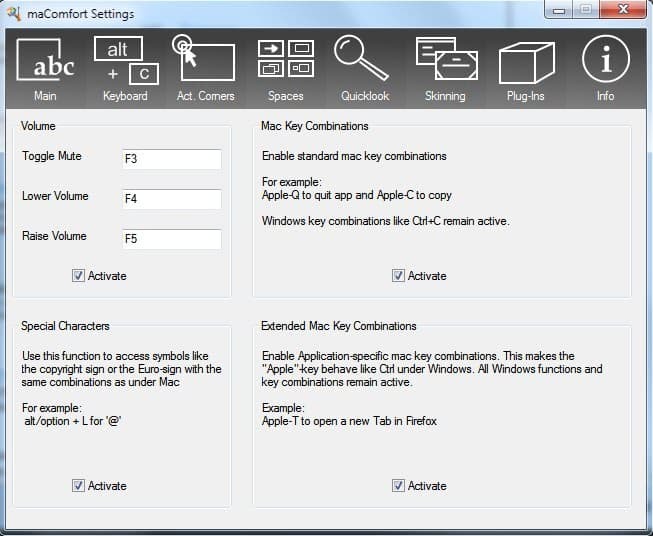 Mac Key Combinations: Enable standard Mac key combinations like Apple Q to quit an application (now Windows Q). All Windows key combinations remain active. Extended Mac Key Combinations: Enables application specific keyboard shortcuts like Windows T (Apple T) to open a new tab in the Firefox web browser. 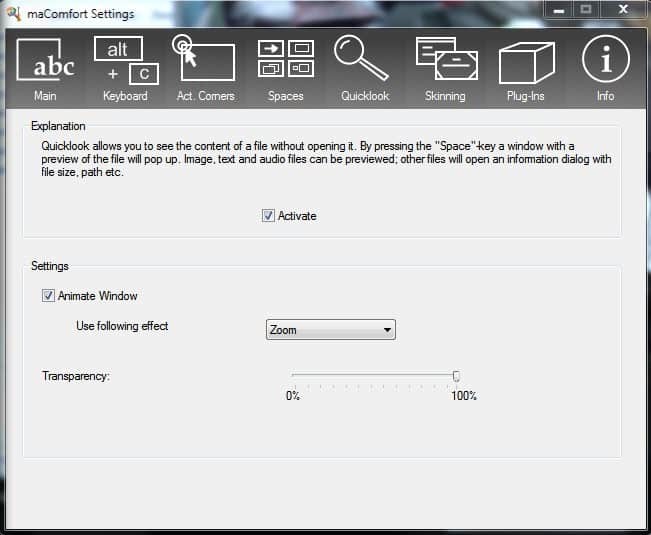 Option to add actions to the corners of windows. 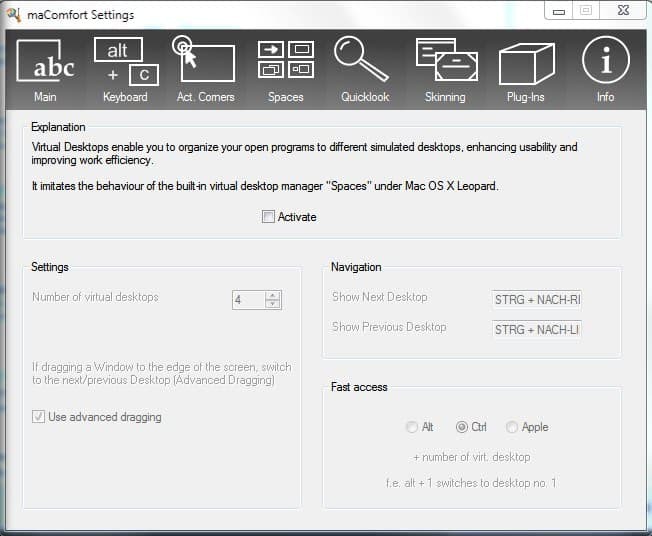 Available options range from using features offered by maComfort to shutting down the computer or starting an application. Spaces imitates the virtual desktop manager under Mac OS X Leopard. It can simulate a number of virtual desktops with navigational shortcuts, fast access options and advanced dragging. MaComfort is an interesting program for Mac and Windows users who want to use some features that the Mac operating system provides under Windows. While it may be useful to Mac users who work on Windows devices as well, it is no prerequisite. Windows users who like some or even all of the functionality can use the program without using a Mac at all. The application is fully compatible with all recent versions of Microsoft Windows. The premium version introduces additional features to the program and allows use in commercial environments. 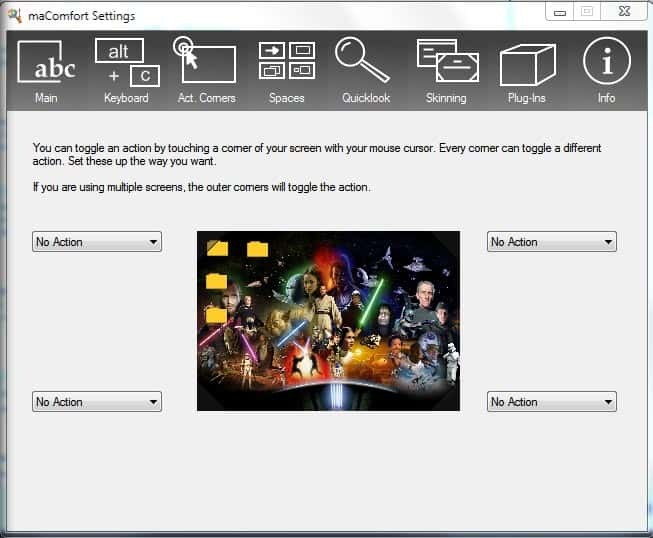 Does it modify the mouse interface to a one button mouse too? I have a lot of Mac folks that gets totally confused by two buttons instead of one button on the mouse. The concept of multiple functions escapes them. Great app…I found Expose to be *really* buggy on XP. Had to disable that. But otherwise, it really handles virtual desktops quite cleanly. The author of this program is exposed, by giving comfort he wants to install a trojan to squeeze you out without your knowledge.This is detected by Kaspersky Internet Security 2010 full updated.Bcoz of this it is not listed at Download.com and any major reputed hosts,it will be caught by many AVs. Install only if you want to give mac comfort to Mr. Klaus as well. Also Mr. Martin is amongst the biggest genius,yet many of softwares listed here are seriously dangerous,obscure from public but if possible plz check the integrity of the vendor if possible. Ruchir it is very likely that this is a false positive. That IS a false positive. Look on Softpedia and other big download portals. There have been many around for NSIS installers. I am sorry if my apprehensions are wrong.Also very happy that the software by Mr. Rafael Klaus is not only astonishing but also clean and harmless.I did not know earlier that NSIS packed ones are more prone to false detections as I am not an expert on making executables.I mistakenly commented on this prog since Kaspersky is otherwise very very reliable and maybe one of the best.Whenever I lodged a complaint about an upload of infected,4shared immediately removes it without doubting Kaspersky,but in this case I am sure Macomfort is clean,Kaspersky is too safe.however I cannot install it since Kaspersky denies its download without asking.Others I hope enjoy it as it is a great one of a type of a program. Best of luck to Mr. Martin and Klaus. Ruchir, I can completely understand your initial doubts, and no-one wants to trust any software from the internet that is being flagged as ‘unsafe’ or ‘potential threat’. I am trying to get everything compiled in a manner (by using different compression) that these annoying false alerts will not happen in the future. Anyways, thank you for your second post.